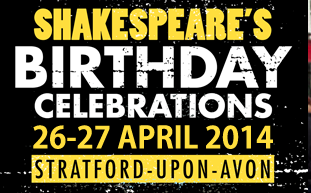 The birthday weekend brings together performers, artists, the local community and ambassadors from around the world in a vibrant celebration of the life and works of William Shakespeare. During the two day event, the town’s streets overflow with music, pageantry and drama and you are invited to enjoy a packed programme of special activities and great days out at the five Shakespeare houses. Sense of “gathering for social pleasure” is first found 1716, from general sense of persons gathered together (originally for some specific purpose, such as dinner party, hunting party). birthday (n.) late 14c., from Old English byrddæg, “anniversary celebration of someone’s birth” (at first usually a king or saint); see birth (n.) + day. Meaning “day on which one is born” is from 1570s. Antony and Cleopatra: AC III.xiii.184.2 It is my birthday. So, members of the Shakespeare’s Birthplace Trust, have a wonderful gala. Have a fabulous social gathering. Celebrate Shakespeare’s 450th birthday, but please, do not party. Shakespeare does not know “party” that way.